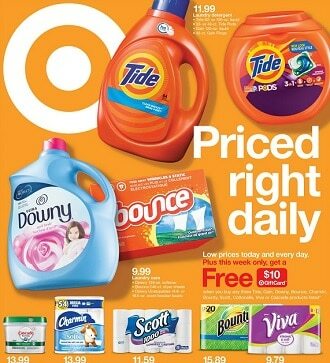 View Target Weekly Ad, deals & sales available April 14 – April 20, 2019. Don’t miss the Target Flyer Sale and electronics & furniture deals from the current Ad Circular. Find super savings for Threshold Windham furniture collection, Vizio televisions, Philips wireless headphones, Fitbit Flex 2, LeapFrog LeapPad platinum tablet, Whimsy Wonder dresses, Apple iPhone, KitchenAid appliances, Samsung Galaxy smartphones, Canon camera, Beats by Dr. Dre wireless headphones, Xbox games, and many more. Don’t miss the latest Target Weekly sales & deals.